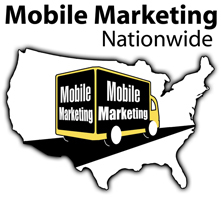 Mobile Marketing Nationwide has a variety of INNOVATIVE outdoor advertising options that compliment your current advertising campaign or will stand out on its own. Our UNIQUE Rolling, Scrolling Billboard technology displays your image and message with a cutting edge, "WOW" factor that attracts interest. Our Mobile Media Campaigns are effective and eye-catching which can target precise neighborhoods with an advertising Multi Media Platform that generates results. Reach a mass audience or target a specific niche; mobile advertising is flexible enough to meet your needs.